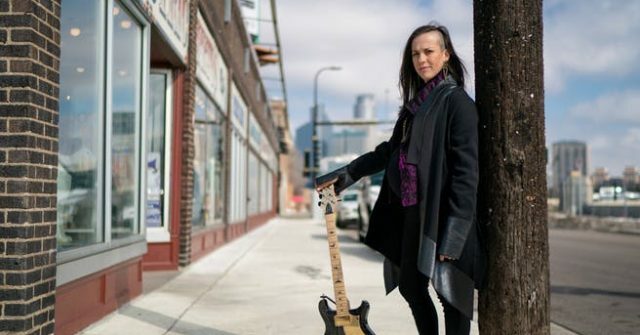 “Three years after playing guitar with 3RDEYEGIRL and Prince, [Donna] Grantis has released her debut solo album, DIAMONDS & DYNAMITE.” To celebrate, The Current invited her to perform an in-studio session on Friday, March 22, 2019. For her afternoon session at The Current, Grantis and crew brought their own lighting; they darkened the room, covered the windows, and flipped on blue LED bars… [Grantis] later revealing that it was Prince who inspired her to reach beyond music and find ways to get creative with performance. See her album release performance of DIAMONDS & DYNAMITE at the Dakota on Thursday, March 28, 2019 at 7 & 9:30pm.